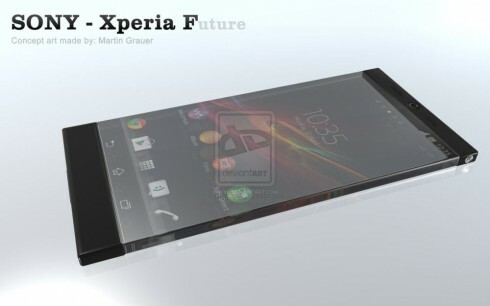 If you’re not tired of Sony Xperia concepts, you may want to have a look at the Sony Xperia F, pictured below. Created by Martin Grauer, this device is based on a big glass slab with two metal/plastic parts that serve as bezels and components holders. I suspect that the handset is actually a normal one and not a transparent unit, although transparency would be cool as well. Anyway, the Xperia F is incredibly slim, probably at around 5 or 6 mm in thickness, it has a big glassy slab in the middle or maybe it’s made to look that way by covering up the edges with glass and also the front. I can’t see any side volume buttons, so I guess it’s all touch, while the On/Off button has been kept a metallic one and integrated into the upper side. This model truly sticks to the idea of edge to edge screen and doesn’t give us a side bezel to hold the handset. I can also spot a front camera and that’s pretty much it. What do you make of this interesting Sony Xperia futuristic design?